In 1-quart saucepan, heat syrup and butter until butter is melted, stirring constantly. Remove from heat; stir in pecans. Heat griddle or skillet over medium heat or to 375°F. Grease griddle with vegetable oil if necessary. In medium bowl, stir all pancake ingredients until well blended. For each pancake, pour slightly less than 1/4 cup batter onto hot griddle. Cook until edges are dry. Turn; cook other sides until golden brown. Serve with syrup. If you don’t have pumpkin pie spice, you can use 1/2 teaspoon ground cinnamon and 1/4 teaspoon each of ground nutmeg and ground ginger instead. Serve with hot apple cider and a small platter of sliced pears and Cheddar cheese. 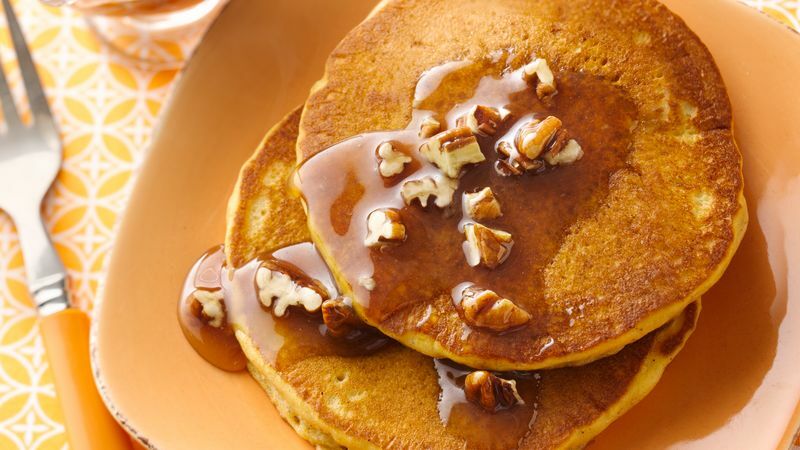 Add flavor and texture to these seasonal pancakes by stirring about 1/2 cup of chopped pecans or walnuts into the batter.